A gooseneck hitch mounts in the truck bed and to the frame and will pull a gooseneck trailer. We can install your electrical source in the bed for easy and efficient access. If you have the need to pull both a gooseneck trailer and a fifth wheel trailer, you can purchase the fifth wheel companion by B&W which converts your 30k gooseneck into a 18K fifth wheel. * Do not exceed your vehicle’s tow ratings. Fifth wheel hitches mount in the truck bed on rails and to the frame. We can install your electrical source in the bed for easy and efficient access. You will need to know the weight of what you will be towing to insure you have enough tow capacity. * Do not exceed your vehicle's tow ratings. Do you need a receiver hitch? Rear receiver hitches are mounted to the frame of your vehicle just under the rear bumper. This is a much safer and efficient method of towing than a ball on a bumper. 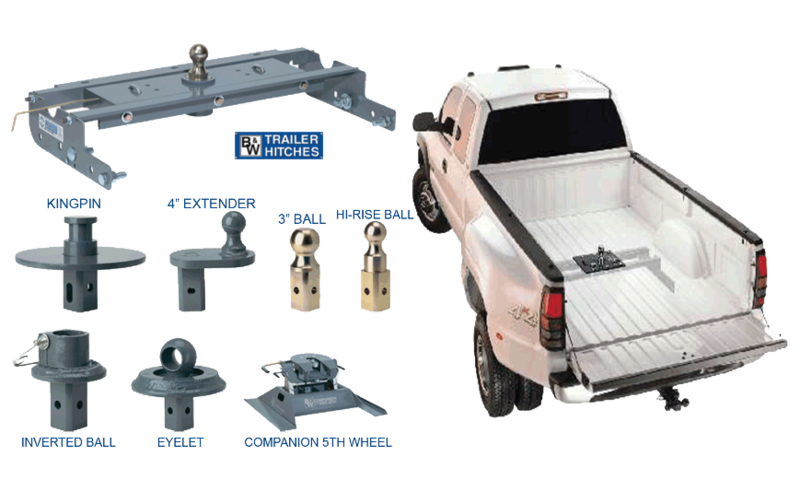 A receiver hitch will allow you to tow a boat, horse trailer, utility trailer etc. and can be used for a bike, cargo carrier or wheelchair lift. Hitches are vehicle specific and depending on what you will use your hitch for will depend on which wiring (if any) you will need. Let OSH TRUCK AND JEEP help you select the best aftermarket accessories for your truck or jeep. Designed by CGH Marketing Website Design 2014.